This trip is now FULL of happy herpers. Try next year, 2020! 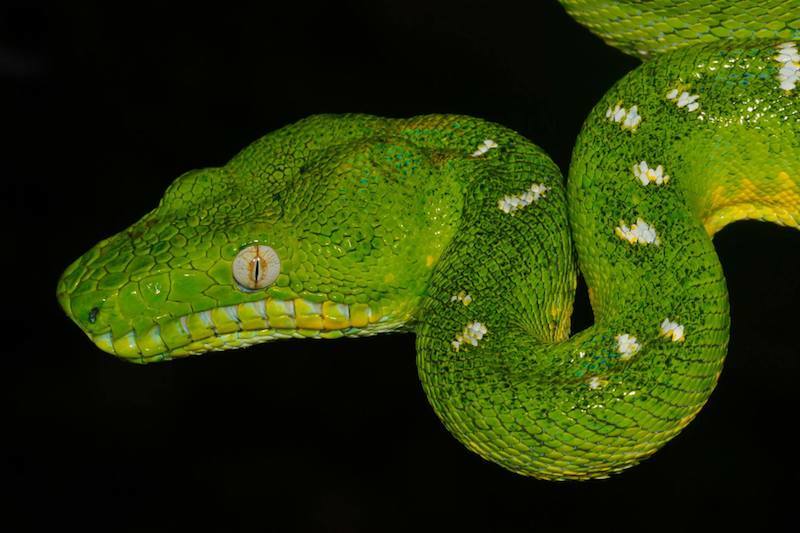 The amphibians and reptiles of the Amazon range from the stunningly ugly to the bizarrely beautiful. And there are lots of them! This ten-day expedition includes stays at two field stations where we routinely turn up more than 100 species of frogs, toads, caecilians, salamanders, lizards, snakes, turtles and crocodilians. Some species we encounter almost every trip while others are so rarely encountered that even jaded “veteran” herpers get excited. Of course, there is no such thing as “jaded” when it comes to these fascinating and diverse animals! We’ll all fly to Iquitos, Peru, by way of Lima to meet and enjoy a Welcome Dinner. Then early next day, we’ll travel to the first site by motorboat while our luggage is handled by hired porters. 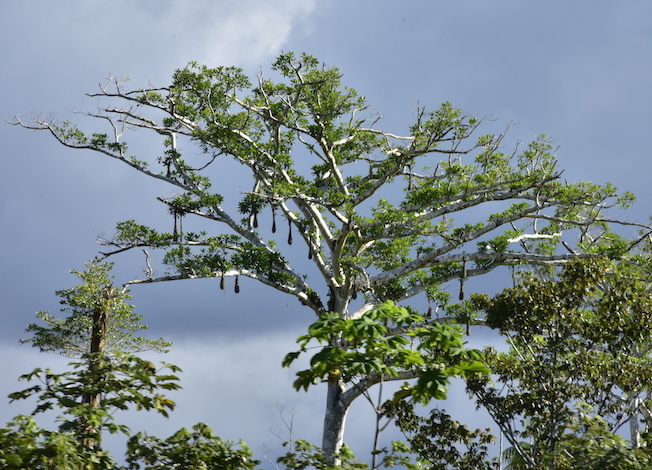 Our expeditions are land-based at biology research stations operated by Project Amazonas. Splitting time between the stations lets us take advantage of the unique specialties of each site. We also have an open skiff for exploring aquatic habitats, and one station has some kayaks for paddling (and maybe fishing?) in the river. Our use of the field stations helps fund and protect these special sites, and we are also adding substantially to knowledge of the herpetofauna of the region. Having a “home base” allows us to explore the rain forest by day and night. Each field site has its own specialties. 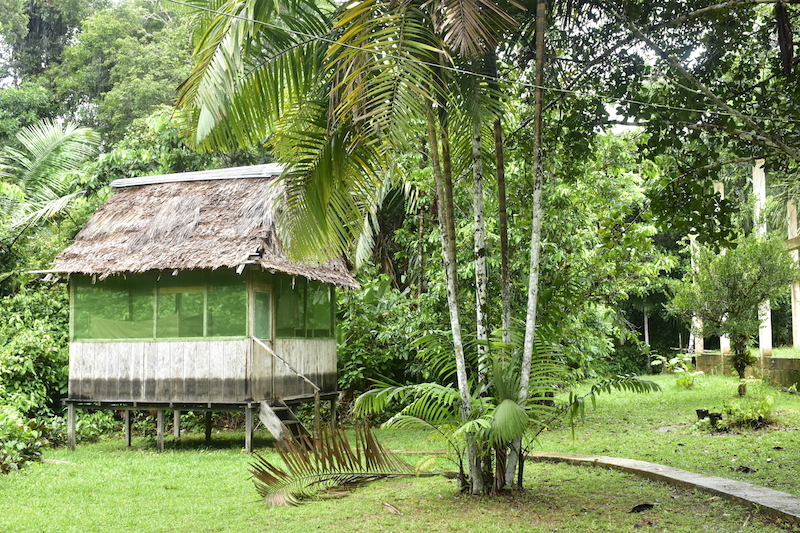 The first site where we’ll stay is the Madre Selva Biological Station. 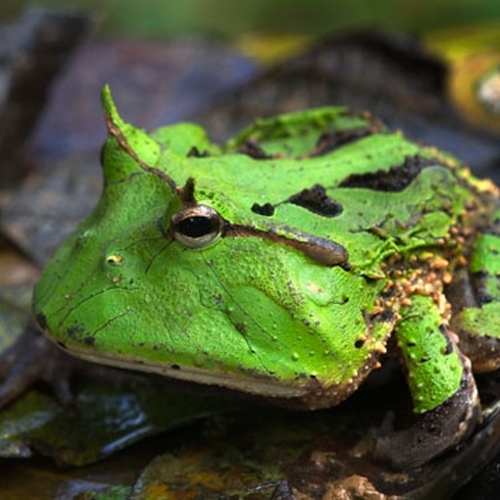 The area is excellent for a large number of hylid frogs that favor aquatic emergent vegetation. Atelopus spumarius, the Amazon harlequin toad is fairly commonly found, and with some effort, a floodplain lake with a population of black caimans (one of three species of caiman on the preserve) can be sometimes accessed by kayak or dugout canoe. 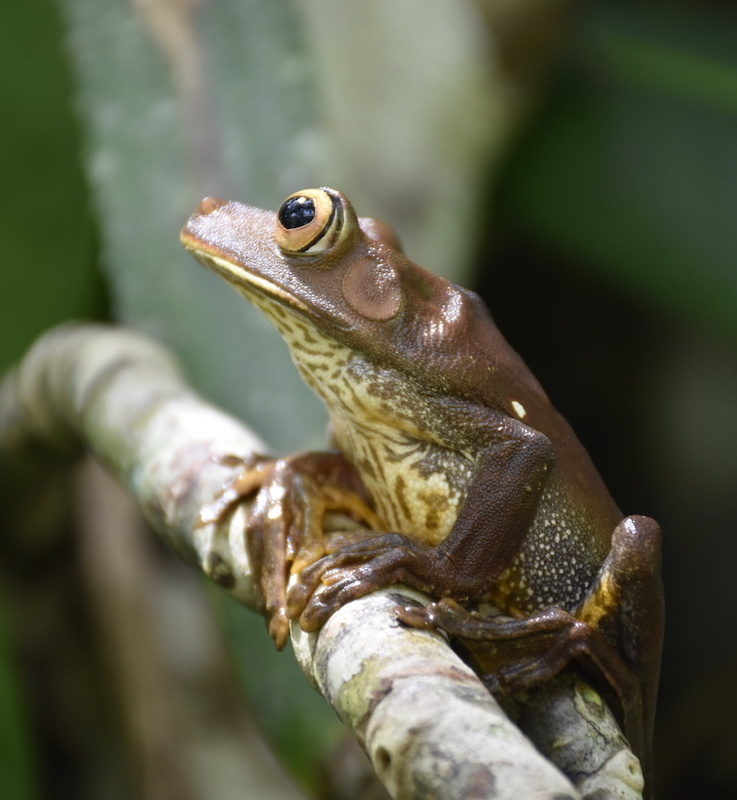 The second site where we will spend the rest of our time is the Santa Cruz Forest Reserve, the site of Peruvian records for several frogs and caecilians. It has also become the “go-to” place for finding the legendary Lachesis muta, or South American bushmaster. While at the two remote stations, we’ll sleep in comfortable “tambos” (a Quechua word meaning ‘wayside stopping place’) or little screened buildings on legs, see photo. Inside each tambo are two single beds with sheets, foam mattresses and of course pillows, all encased in mosquito netting. There are ‘Western’ toilets and air-temp showers in the bath block, so while you are experiencing a remote environment, you will be still be comfortable! We’ll eat three delicious ‘buffet-style’ meals a day in the dining hall, just off the kitchen. The Peruvian cook and his assistants who travel with us make an excellent variety of dishes daily, often utilizing local fruits and vegetables such as yuca and cocona. An amazing diversity of creatures will be encountered on this fabulous trip! In 2018, we found interesting birds, weird insects, and tropical flowers as well as 100 kinds of herps! The organizing company, MT Amazon is the ONLY tour company in the Peruvian Amazon that dedicates 100% of its resources toward the preservation and welfare of the Amazon rainforest and its people. Click here for more info about this MT Amazon tour. Mike Pingleton: (Expedition Leader/Photographer/Herp & Bird Expert) For more than forty years, Mike has been pursuing amphibians and reptiles in the field. 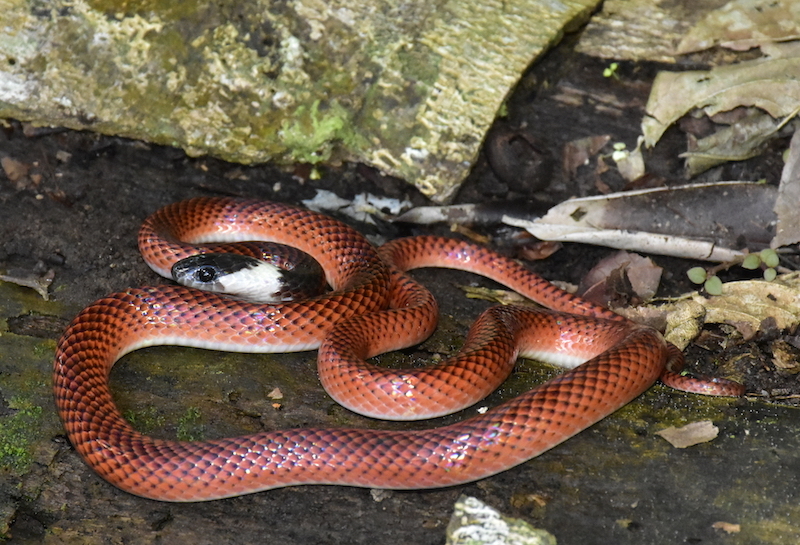 Along with covering much of the United States, Mike has also pursued herps in Mexico, Panama, Belize, Peru, and most recently, Thailand. Mike has written extensively about field herping, including articles for Herp Nation and the International Reptile Conservation Foundation. Mike is also the author of a how-to manual on Redfoot Tortoises; he has written several children’s e-books about herps, and is currently working on two books related to field herping. Matt Cage: (Expedition Leader/Herpetology/Photographer). 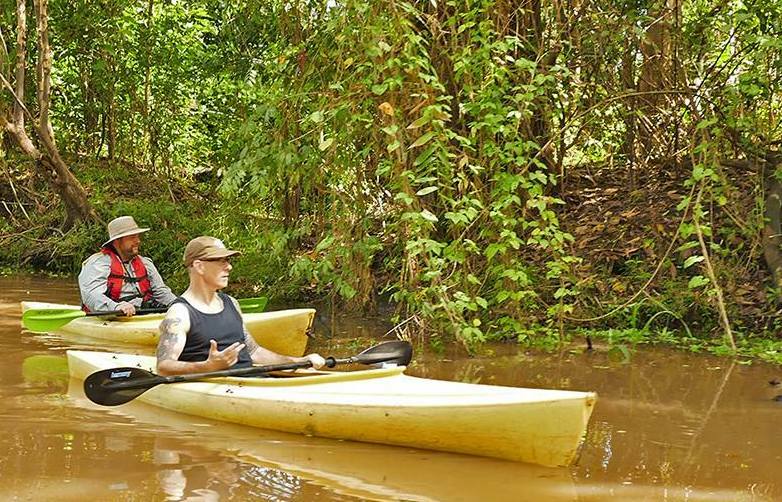 Matt has extensive experience guiding trips and traveling to the American tropics. Matt has been a trip leader for MT Amazon Expeditions since 2010. Matt has traveled extensively and photographed wildlife in the Caribbean, Mexico, Central and South America. You can see Matt’s photos in many published books and papers (and the boa and horned frog here). Matt is a Wildlife Biology major from Colorado State University and currently lives in the Denver metro area. 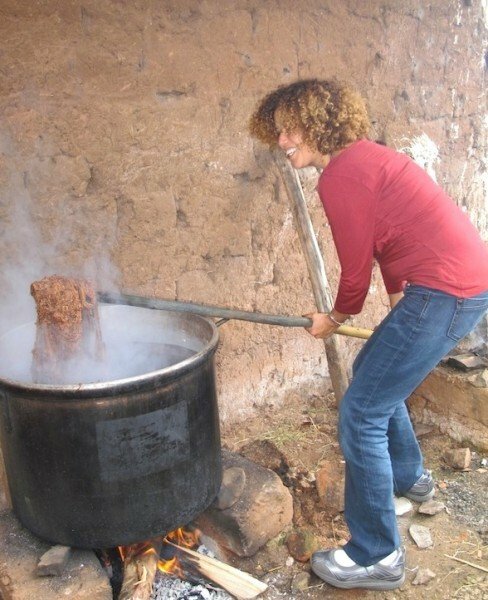 These two exciting tours are led by me, Cynthia LeCount Samake, and Claudia Avila [below, dyeing wool], who is Behind the Scenes’ South America expert. 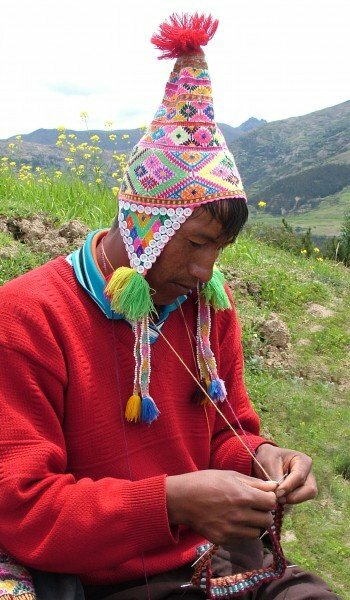 I’m an expert on Andean culture and indigenous textiles, and the author of “Andean Folk Knitting: Techniques and Traditions of Peru and Bolivia.” I have been to Peru and Bolivia about 42 times in the past 35 years, and every trip is magical! Claudia is an experienced and organized trip leader, with excellent Spanish, a ready smile and a positive attitude. Her main specialty is world cuisine, and on these two trips, we will eat in some of the best restaurants in Peru and Bolivia. She will show us local markets with unusual traditional ingredients which you may want to try–such as purple potatoes or roasted Guinea pig! 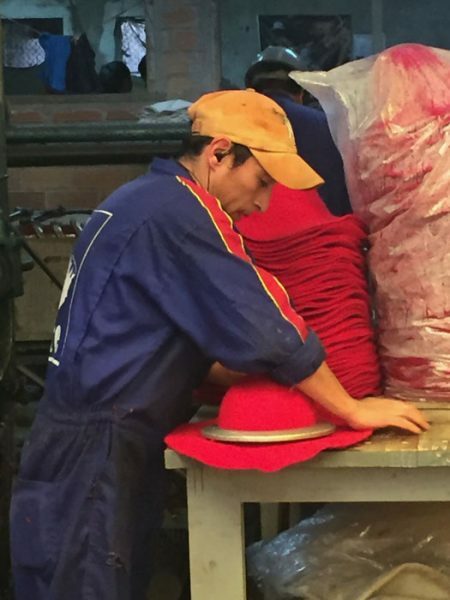 Behind the Scenes cultural and textile tours are for learning, exploration, expanding our worlds–and having a good time! Everyone is welcome! 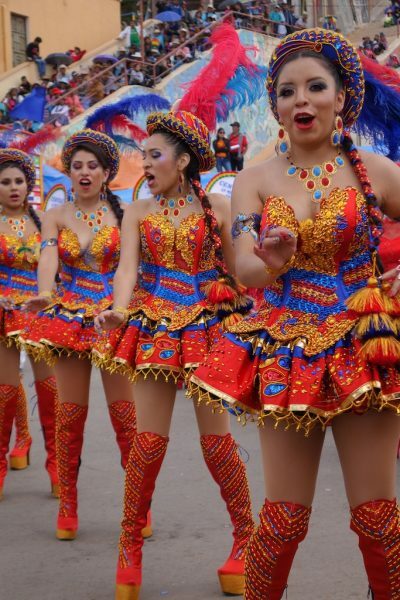 We will visit highland villages where the people make all their own clothes, and we will explore Inka sites such as Machu Picchu and the huge ceremonial site of Sacsa-huayman. In Bolivia, we stay at the edge of Lake Titicaca and visit friends on the Urus Islands in the lake; we also visit a working mine in Potosi and sleep in a historic hacienda. You can sign up for either trip or both together. 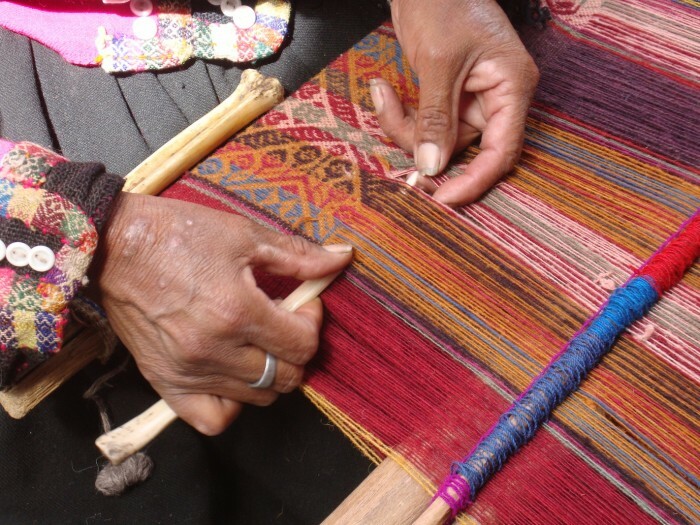 The PERU trip includes the possibility of attending the optional weaving conference called TINKUY, the Weavers’ Gathering, sponsored by the Center for Traditional Textiles in Cuzco (CTTC). The Center helps highland villages to market their textiles and has had a very positive economic impact on many remote areas. If you don’t plan to attend the conference, Claudia and I have planned some fabulous activities, see itinerary below, including visiting villages. Textile Center Director, Nilda Callanaupa and I have coordinated the dates of the PERU TOUR so that Tinkuy falls at the end it, then the BOLIVIA TOUR begins. 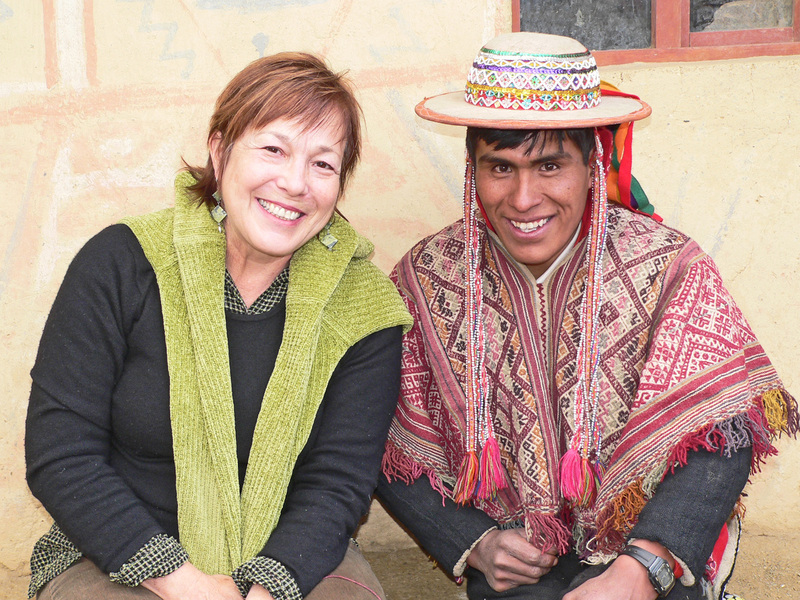 A tax-deductible donation of $250 to CTTC is included in the tour price for the Peru portion. Note that 3 meals a day are included except in a few places where a lunch or dinner is ‘on your own.’ Breakfast is always included, in our hotels. Nov. 5 A wonderful day in the temperate seaside city of LIMA! 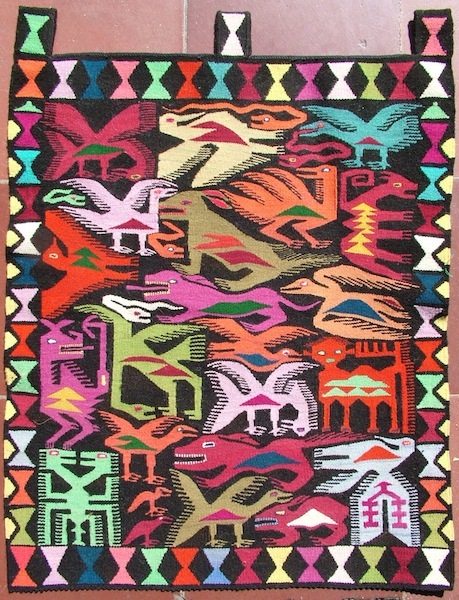 Two great museums: Larco Herrera for some textiles but especially Moche period portrait pots and other vessels such as bats, snakes, llamas, crabs, potatoes, even corn pots; and Amano Museum for fabulous pre-Hispanic textiles, especially Chimu cotton gauze weave shrouds. We’ll have lunch and dinner at some of Lima’s great restaurants. Each day during the trip, Claudia will take us to lunch and dinner at special places where she loves to eat! Nov. 6 Fly over the Andes to CUZCO, 1 hour flight. Check in to our centrally-located and heritage building hotel. Eat lunch then stroll around city to acclimate. 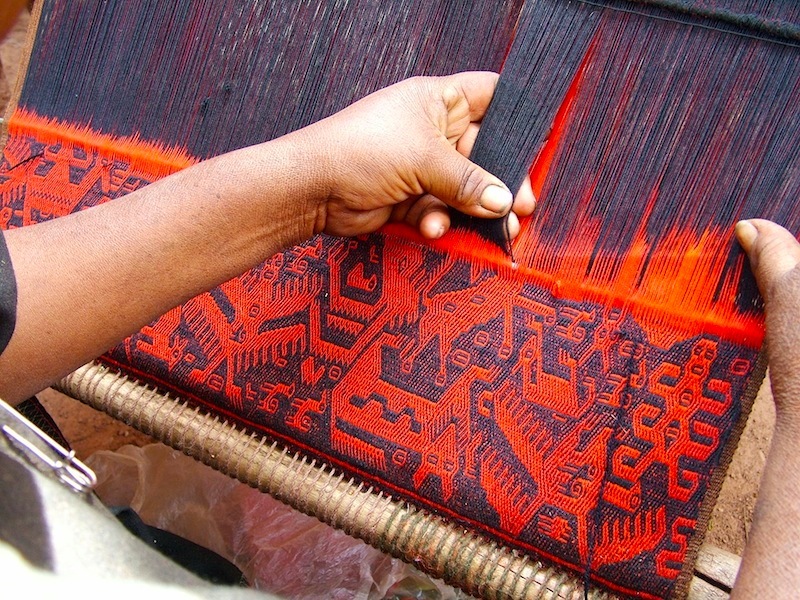 Visit the excellent Museum at Center for Traditional Textiles of Cuzco, CTTC. 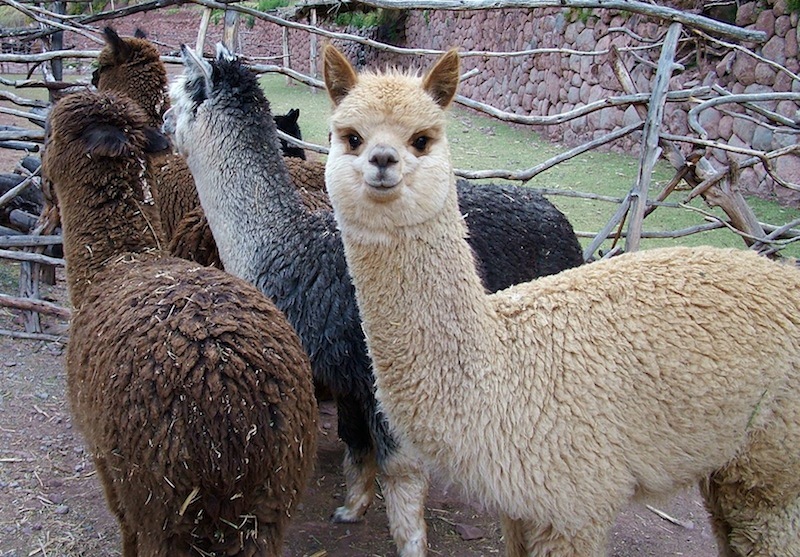 Buy white alpaca yarn from the Michell alpaca shop, around the corner from the hotel, for dyeing on Friday–white, and maybe some of the gorgeous colors! Nov. 7 Textile village visit–Visit the Andean village of Pitumarca to meet our old friends here who are amazing knitters and weavers. 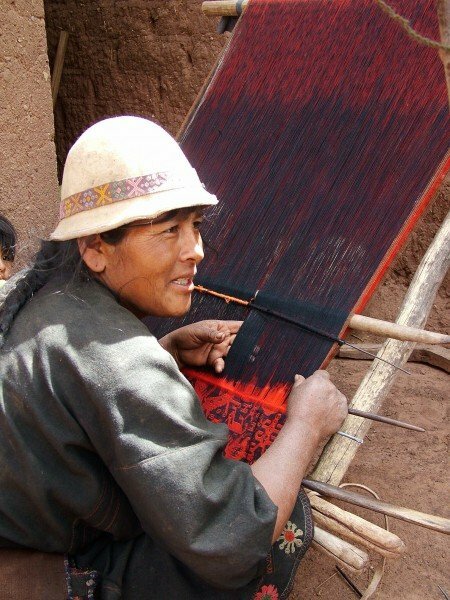 You will be able to see the contemporary knitting and weaving of this Quechua-speaking community and buy some of their beautiful work. Picnic lunch in the weaving compound. 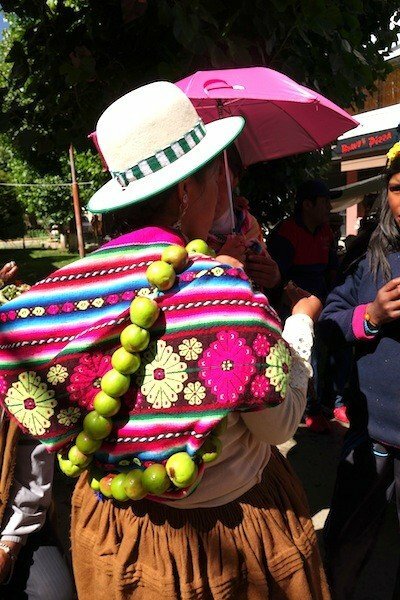 Visit the famous little Andahuaylilas church; meet male knitters from Sallac who employ the cleverest techniques for their complex, multicolored caps. Nov. 8 Drive about an hour, over beautiful rolling hills of quinua and potato fields, to Chinchero (Nilda Callanaupa’s village). We will have a half-day natural dye workshop with the ladies here. Color your white alpaca yarn with cochineal, one of their favorite dyes, or another choice from their supply of flowers, leaves and lichen that make their rich colors. Picnic lunch. Rest of afternoon free in Cuzco. Nov. 9 Train to Machu Picchu National Park (UNESCO Cultural Heritage site), visit the magical place with professional guide, then free time in the ruins; overnight in Machu Picchu Village at Terrazas del Inka. Nov. 10 Visit MP National Park again in the morning. The first shuttle bus departs for the site around 5:30 am. People talk of the ‘sunrise’ at MP, but in reality, it is most often clouded over. Maybe you’ll be lucky! In any case, if you arrive early, you can climb Huayna Picchu, the peak at the far end of Machu Picchu. The climb is much easier than it looks, because there are steps the whole way, and even a firmly attached chain to hang onto, on the steepest part. I have climbed it 3-4 times, and the view is absolutely spectacular from the top! Return to Cuzco on afternoon train. Nov. 11 Stroll through Cuzco town, peek into the Cathedral, continue across the Plaza de Armas, to the street of the 12-angled stone, one fabulous stone in a whole foundation of amazing stonework walls. 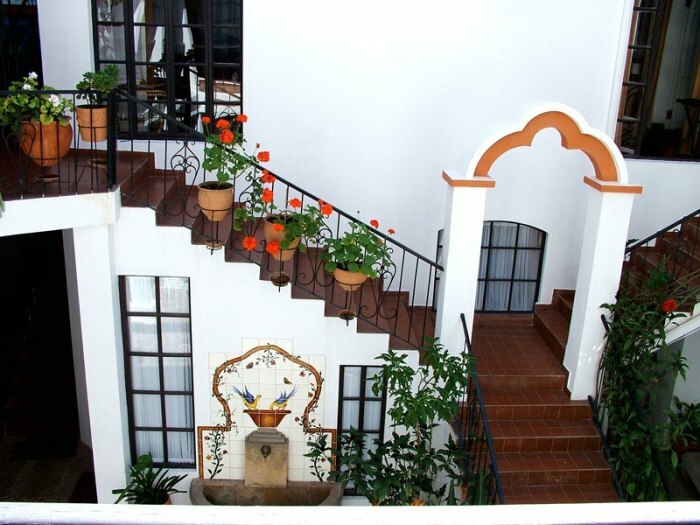 Continue to Plaza San Blas, visit the Pre-Hispanic Museum, have tea or a drink at the beautiful old convent hotel. Walk back down and have lunch at Jack’s, just in case anyone is feeling homesick! After lunch, walk down Triunfo Street, visiting favorite jewelers, and the suede/textile bootmaker. Nov. 12 FREE morning. Lunch then drive up to Sacsahuayman, spectacular Inka fortress /ceremonial site above Cuzco. Sacsahuayman is known for amazingly huge stones fitted into zigzag walls, set around a grassy central area. Continue to the Inka fountains/’baths’ at Tambomachay and admire the fabulous stone carving. We will also visit the Inka Museum, near the Plaza de Armas, above, right. OPTION: TINKUY event begins late this afternoon. Nov. 13 Ascend to a remote village and meet many of my old friends: knitters, weavers and 7-year old Little Cynthia, my namesake! below, with her mom, Andrea. (Lil Cynthia’s father, Roberto, is in the photo above, with me also.) This high, barren village is the least prosperous of the Textile Center’s project villages; you might bring school supplies that we can donate to the teacher here. These people will be working on their textiles. You can feel comfortable here and in other CTTC project villages, watching interesting techniques and taking pictures. The weavers and knitters may have some intricately patterned textiles that you can purchase directly from the maker; items you buy greatly help to improve their standard of living; see weaver working on a complex pattern at right. Dinner on your own. OPTION: TINKUY activities during the day. Nov. 14 In the morning, we’ll head out of Cuzco by van to see two fascinating sites. First Moray, the circular Inka agricultural terraces: note in photo below, right, the dots on different levels at 12 o’clock are people! Then we’ll view Maras, the huge site of salt evaporation pits, built into a hillside. Visually Maras is also spectacular, white basins ringed with brown earth. When we return, we’ll have lunch in town then free time in the afternoon. (Cynthia can show you favorite little stores and artisans’ workshops if you want to buy something special.) OPTION: TINKUY activities during the day. Nov. 15 Morning visit to TicaTica, the women’s knitting cooperative that friend Hilda organizes, to see their work. These women design and make beautifully patterned alpaca sweaters, by hand and on basic knitting machines. There will be some of their colorful sweaters available here to buy. Lunch with the ladies. After lunch, we’ll visit a ceramic studio where they make vessels but also buttons and beads. In late afternoon, free time. 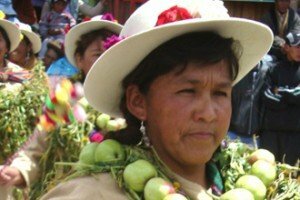 I will teach a mini-workshop on Andean decorative techniques to anyone interested. I can show you the little scalloped edging found on many knitted caps (chullos), and the bobbly finger-crocheted yarn made in several villages and incorporated into the knitting. Dinner on your own. OPTION: TINKUY activities during the day. 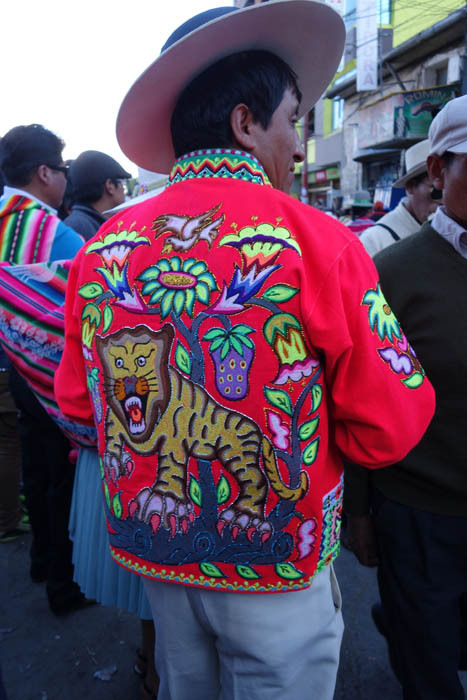 For the BOLIVIA TEXTILE TOUR travelers, this is your last day in Cuzco before we depart tomorrow for Lake Titicaca and Bolivia. By now you will know Cuzco well, and will probably want to return to some shops for final purchases, or museums for some more time with the ancient pieces. You might just hang out at the Starbucks above the plaza and people-watch all day! Lunch on your own. Andean Folk music show with Farewell Dinner. 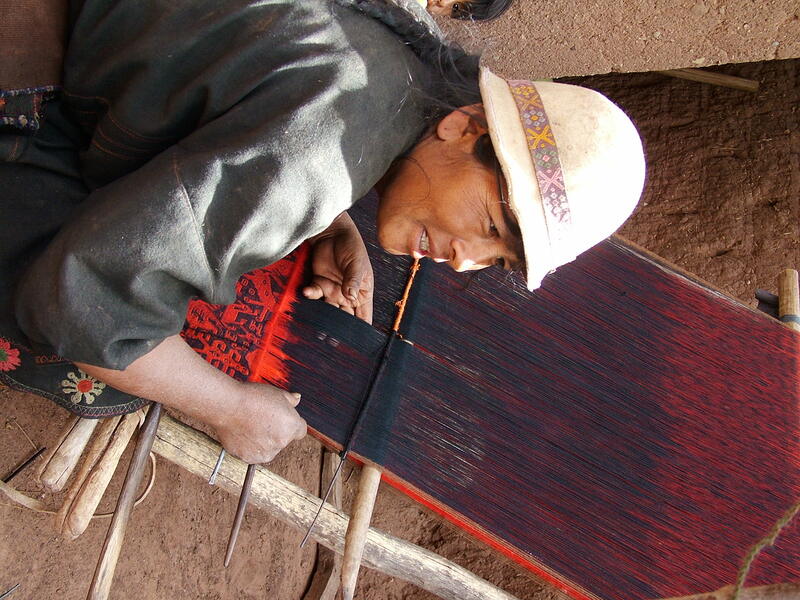 Both prices include a tax-deductible $250 donation to Textile Center of Cuzco. • Private professional, licensed guide at Machu Picchu. Nov. 17 Visit Pisac Market on our way out of Cuzco. 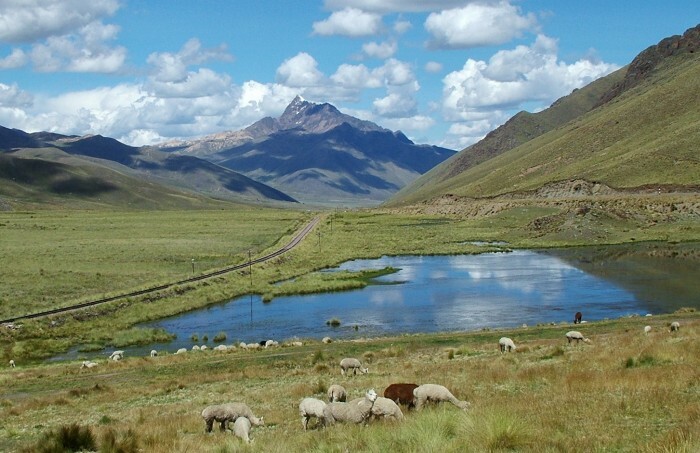 Drive to Puno, over the high altiplano, seeing herds of specially bred white alpacas along the way. Stop to photograph them and the snowy peaks in the distance. Cross the La Raya pass at almost 15,000 feet, get out and feel the altitude take your breath away! Arrive in Puno for the night, at the edge of Lake Titicaca. Nov. 18 Early next morning, we’ll board a motorboat to cross a small part of Lake Titicaca to visit the Urus Islands, home of my young god -daughter, Anita, above right. 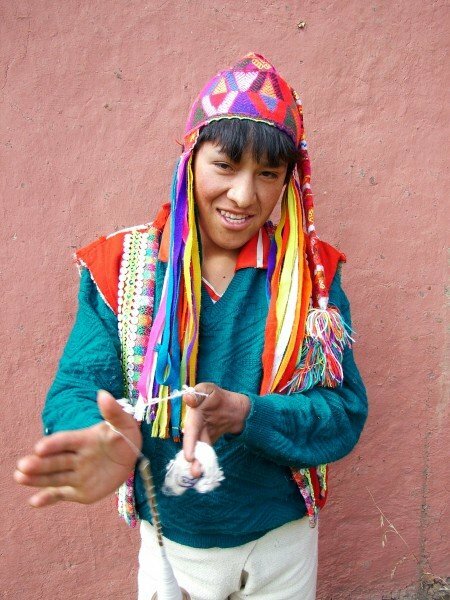 Her parents and family will show us island life and their traditions, then we head back to Puno. Pick up our bags from the hotel, and drive in the van to the border with Bolivia. Cross the border (we can get visas upon arrival–at a steep $135) and continue over the high plains dotted with small villages near the lake. Overnight in Copacabana at the edge of Lake Titicaca in a beautiful eco-hotel, where every room has a lake view, excellent restaurant here. Nov. 19 Explore the little town of Copacabana this morning. There is an impressive Moorish-influenced Cathedral on the small plaza; check out the beautiful hand-carved doors with images of Lake Titicaca myths. Also there is a Poncho Museum that may be open. The super-energetic can climb up the hill of the Seven Stations of the Cross, for amazing 360 degree views out over Lake Titicaca. Bus for LaPaz (same good company as hotel) leaves around 1pm, after we have lunch of delicious pink lake trout or other dish. Arrive La Paz in a few hours and check in to hotel. Walk around the neighborhood which is in the interesting “Indian Market” area. We will have more time to explore La Paz when we return. You may also leave bags at the hotel when we head south to Sucre. Overnight La Paz. Nov. 20 Up early for morning flight from LaPaz to Sucre, 1 hour flight. Check into our lovely hotel, in an 18th C mansion, with wonderful view terraces full of flowers. Lunch, then visit ASUR Textile Museum (Museo de Atre Indigena), in a 17th C colonial home. This small museum shows excellent traditional textiles from the towns surrounding Sucre—Ravelo, Potolo, Tarabuco, Candelaria, etc. Watch weavers at work in the courtyard, using different techniques and oblique looms (which we did not see before on our visits to weaving villages in Peru). Visit University Anthropology Museum, with good folklore and ethnography exhibits, if time/energy allow. Relax on the hotel’s rooftop terraces or walk around Sucre’s pretty central plaza, only three blocks from our Hotel. Dinner near the hotel. (Since we will be coming back to this hotel, you may leave extra bags here in safe storage while we are on the road.) Overnight Sucre. Drive in van to Potosi (3 hours with interesting stops along the way), considered the world’s highest city and known for the riches and tragedies of its mining history. The founding of the city and the discovery of fabulously rich silver veins went hand in hand, in the mid-1500s. 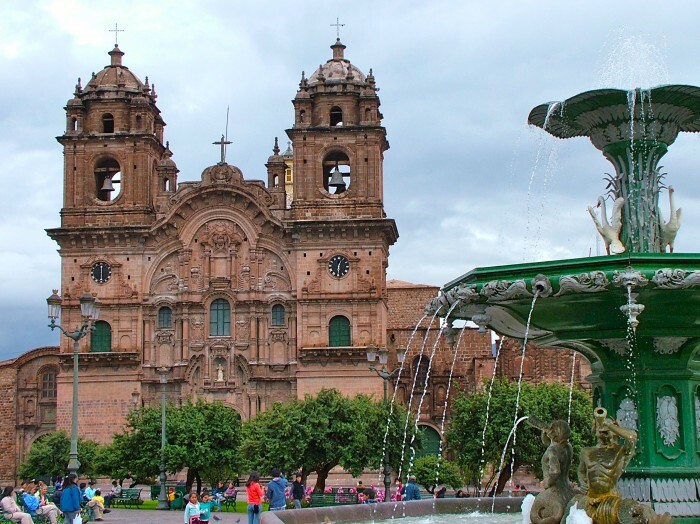 By the end of the 18th C, Potosi had grown into the largest and wealthiest city in all of Latin America, and many beautiful colonial churches and building still hint at this former splendor. Lunch, then to the HACIENDA in afternoon. 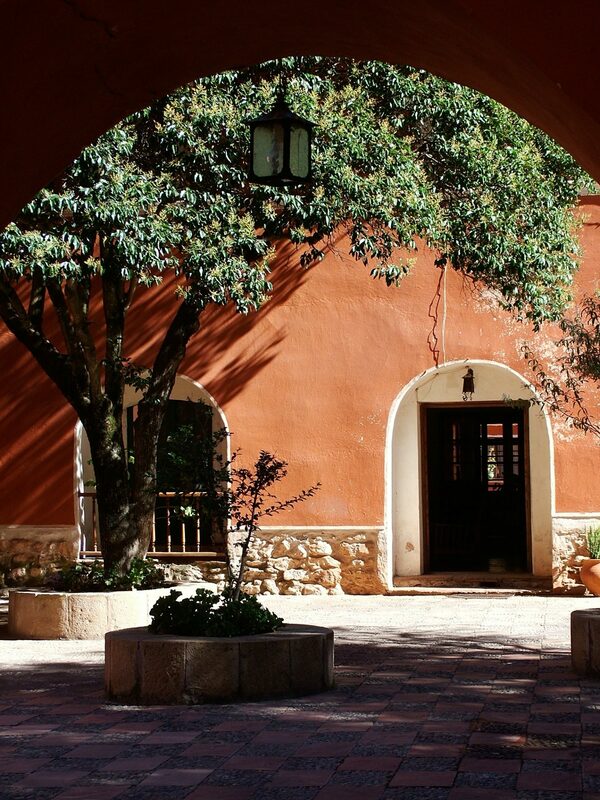 The Hacienda is a peaceful retreat in the valley near Potosi, and it dates from colonial times when the opulent mansion was owned by the Viceroy of Toledo. 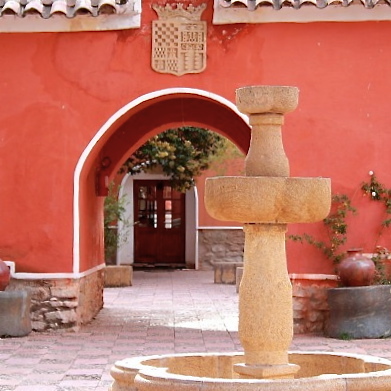 The hacienda remains a working farm, producing vegetables and dairy products for the city. Staying there is like relaxing in a comfortable home with a gracious friend—where antiques abound, and the library, private chapel and museum are fascinating. The focal point of the living room is a cozy fireplace. Family-style dinner at Hacienda, at long, antique table in historical dining room. Overnight POTOSI hacienda, below. Nov. 22 Return to Potosi for a fascinating visit to a Cooperative Mine in “Cerro Rico” or rich hill. (Mine Tour is optional. Anyone claustrophobic can stroll around town.) Silver originally mined here is all gone; now they search for lead and other minerals. You will be outfitted with hard hats, slickers, boots and miners’ lamps. Be prepared for walking over muddy gravel through low tunnels for “an unforgettable look at debilitating working conditions of men doing the job from Hell, that should have gone out with the Middle Ages,” says Lonely Planet. Some mines are larger and have larger tunnels, better to visit. If you don’t want to visit the mine, you could visit the handicraft market, or the Royal Mint (Casa de la Moneda). Colonial coins were produced on a variety of interesting equipment, and the building also now includes a museum of colonial treasures. Lunch. If time, visit the Carmelite Santa Teresa convent with its amazing art and artifacts, then stroll the Handicraft Market, before returning to Sucre for the night. Overnight Sucre. Nov. 24 Buffet breakfast, then early morning van (2 hours) to Sunday Tarabuco Market. 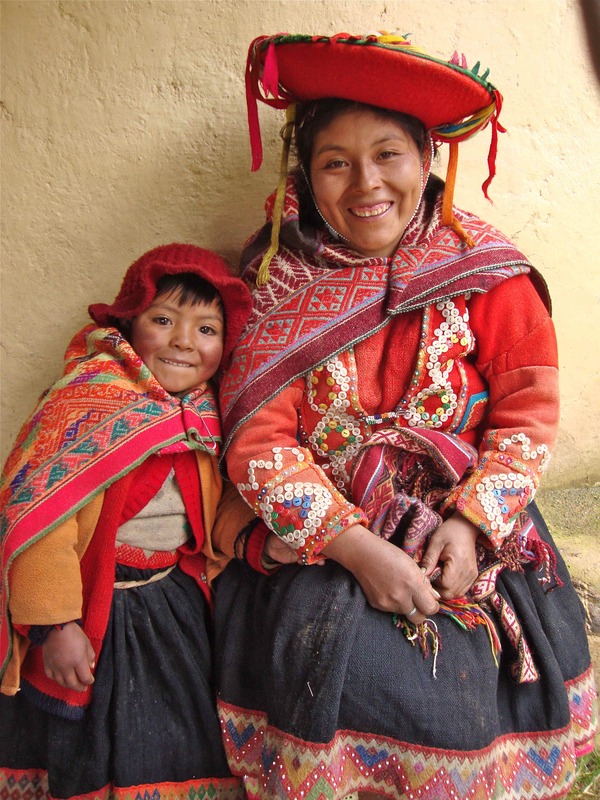 People living in this area maintain their traditional culture, evident intheir unusual dress, interesting customs, and Quechua language. 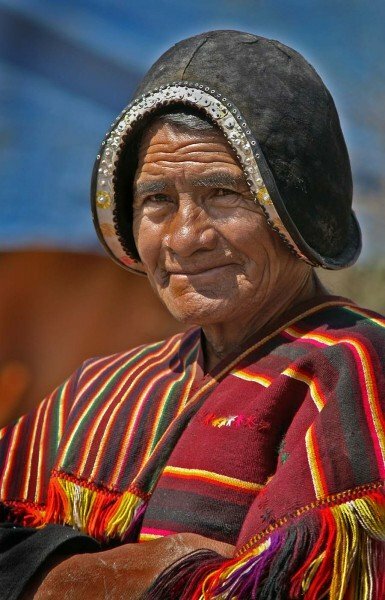 Men typically wear rounded, black leather helmets, called monteras, reminiscent of the conquistadors’ helmets, with colorful hand-woven ponchos, pants and sandals. 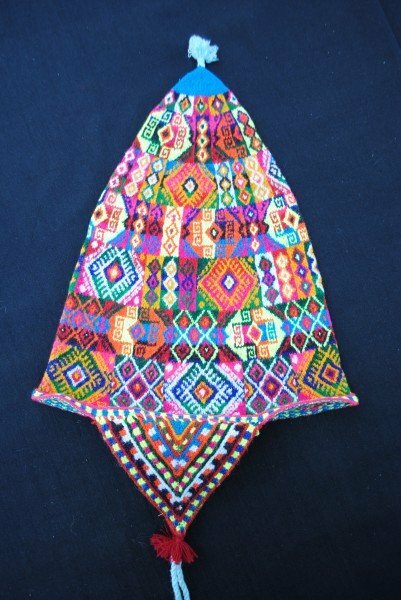 Women also wear hand-woven clothing with different hats, and adolescents wear yet another type of hat, a tightly crocheted, rigid, black version called a “tadpole” hat because of the tail down the back. At the colorful, bustling market, villagers from nearby communities converge to purchase or barter for food and supplies. 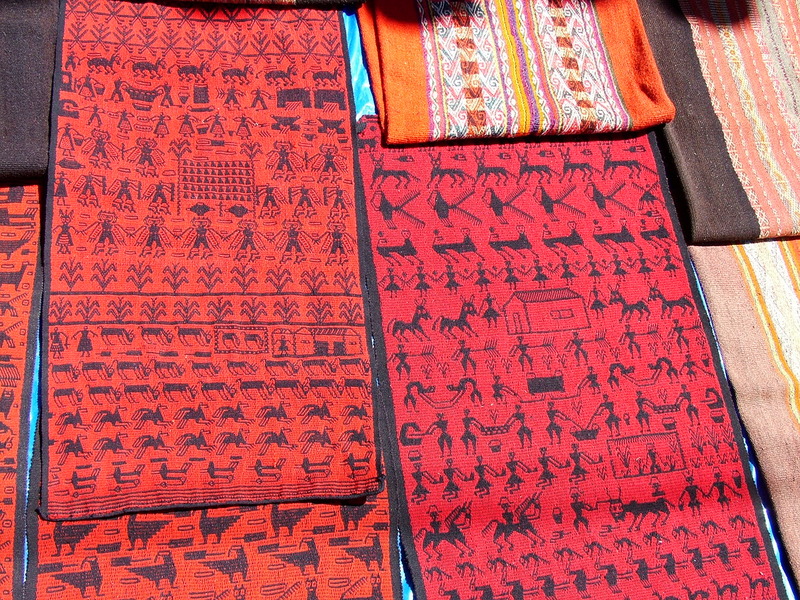 The market is quite touristic, but interesting nevertheless, and they sell some marvelous textiles in nearby stalls/shops. After lunch, we’ll continue back to Sucre. Free afternoon in Sucre. Overnight Sucre. Nov. 25 Flight back to La Paz. Check back into our hotel, walk down Sacarnaga Street for lunch then spend the rest of the day exploring La Paz on your own. Overnight La Paz. Nov. 26. Free day in La Paz. Or you could take an optional day trip to the archeological site of Tiawanaku. Our hotel’s tour department has convenient and good Tiawanaku tours which include lunch, for a nominal cost. The Museum of Ethnography and Folklore is very interesting with drawers full of very accessible textiles to admire. (Fine hand-knitted cap from North Potosi Department, below.) Lunch on your own. Farewell Dinner. Overnight La Paz. Nov. 27 FLY HOME FROM LA PAZ, BOLIVIA. Breakfast only included today. Transportation to airport included this day Please note that we do not make airline reservations, but will be happy to give you the contact info for our good travel agent. To combine the PERU and BOLIVIA tours, American has good prices on Muli-City fares, for combining the itineraries. FLY into LIMA [code LIM] and FLY home from LA PAZ [code LPB. 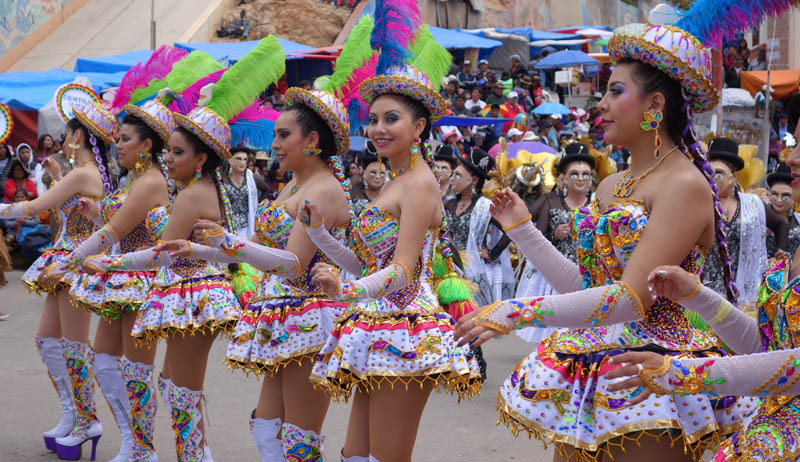 If you want to join the Bolivia tour but not the Peru tour, you’ll fly into Lima, and then fly home from La Paz, so that you experience the altiplano and Lake Titicaca. This route is done most easily on American Airlines, at around $1050 now from San Francisco–and the flight one-way to Cuzco is only $144 in November on LAN. OR call about meeting the group in LaPaz, Bolivia. This possibility will cut 2 days off the itinerary, and the price will be different. Be sure to call Cynthia if you have any questions about these itineraries.